Named the David & Amy Fulton Concertmaster in May, Noah Geller begins his new role with the Seattle Symphony, September 18–20. 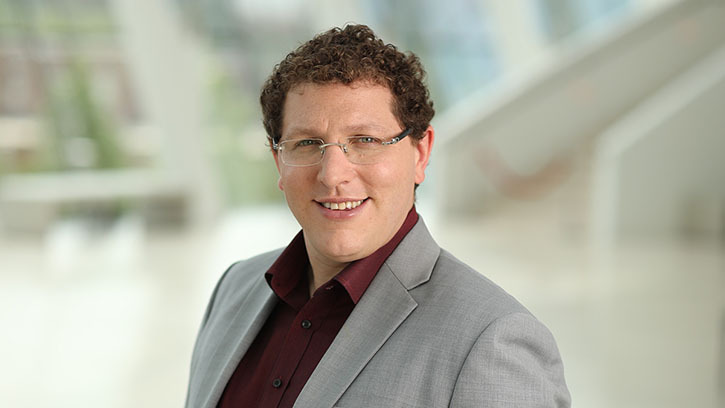 We are delighted to welcome Noah Geller to the Seattle Symphony this month! The Seattle Symphony’s David & Amy Fulton Concertmaster, Noah is scheduled to join Music Director Ludovic Morlot and the orchestra for the first time on September 18–20 in music by Debussy, Janáček and Beethoven. Noah comes to the Seattle Symphony from the Kansas City Symphony where he was Concertmaster for six years. He previously held posts in The Philadelphia Orchestra as a first violin section member and later as Acting Assistant Concertmaster. In addition to his experience with orchestras, Noah has performed with chamber music festivals around the country, including the Marlboro Music Festival, Orpheus Chamber Orchestra, Tanglewood Music Center, and here in Washington at the Olympic Music Festival in Port Townsend. Learn more about Noah below and welcome him to the Seattle Symphony! What originally drew you to the violin? How did you get started playing? I began playing when I was 5 years old. My father was a professional singer, so music was in the house when I was growing up. My parents let me choose to study any instrument, and I picked the violin. I’m sure I was drawn to it by the sound of some recordings we heard, but I can’t remember what exactly I was thinking when I was that young. When did you know that you wanted to be a professional musician? It took me a long time to fall in love with the violin. My young years were rather spent playing baseball or spending time with friends, actively trying to avoid practicing. But once I started exploring the music and realizing that I had an affinity for the violin, I became very focused. This happened around age 14. It helped that I was spending summers at music camps. Being in a community of musicians was very inspiring to me. What do you love most about playing with an orchestra? I love the music and the camaraderie. I never get tired of playing the great works in the repertoire, and there is no way that I will be able to play it all in my lifetime, so it’s a constant journey and learning process that always keeps you on your toes. Furthermore, there are so many great players with you on stage — it is great fun to try to make it into a big chamber music group and draw inspiration from your colleagues. For those you might not be familiar with the title, what is the role of a concertmaster? Historically, the term concertmaster comes from the 19th century when there was no conductor — orchestras relied on the first violin to lead. The modern concertmaster’s role is, in my opinion, about being an artistic leader in the orchestra. I feel that if I am always fully invested in the music and playing with commitment and energy, then this will be contagious and the whole string section and orchestra can feed off of it and express themselves more. As musicians, we are responsible for communicating the music to the audience. For me this is the most important thing, and if there is communication, then concerts can be a beautiful experience. When you’re not playing violin, what is your favorite thing to do? I enjoy spending time with my wife, percussionist Mari Yoshinaga, and dog, Monkey. I’m an avid baseball fan and I love going to games. I don’t follow a particular team, but every time I move to a new city, they win the World Series. When I moved to Philadelphia, the Phillies won in 2008. And when I moved to Kansas City, the Royals won in 2015. So maybe the Mariners will win 2018 or 2019? I’ll be cheering for them! Now that we’re in Seattle, I can’t wait to explore the great hikes surrounding the city. And, even though it’s cold, I love going for impromptu swims in mountain lakes. I really look forward to joining the fantastic Seattle Symphony family and to getting started performing!